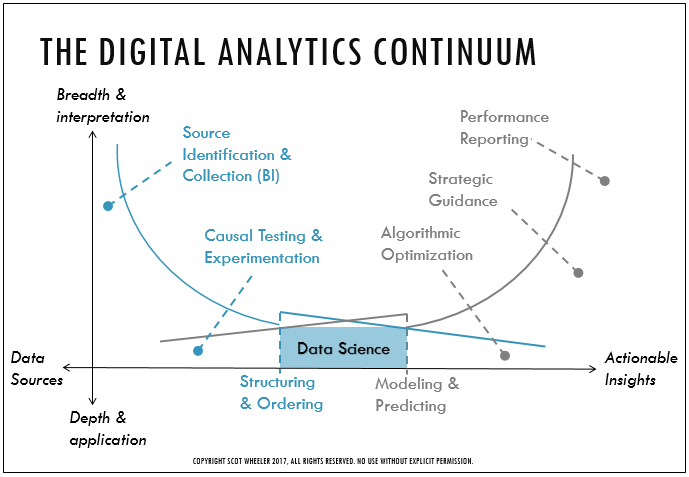 In leading digital analytics teams for a decade now, I’ve experienced the need for an array of specializations in digital analytics work. I have also observed that every analyst I work with has a strong preference for and comfort with certain digital analytics skills, but typically not with all of the possible specializations. An interest in breadth of focus and interpretation of data combined with an interest in the source of data produces an analyst who will excel at developing data collection and data management strategies – from tagging, to API integration, to data warehouse design. An interest in where data comes from combined with a focus on using data to go deep on applied questions yields an analyst who is best suited to work on marketing experiments and causal test design. At the ‘Depth and Application’ end of the spectrum there rests the special case of the Data Scientist, who blends a source-focused affinity for structuring and ordering content with action-focused modeling and predictions. On the other side of data science driven modeling is the capability for Algorithmic Optimization. This analyst should be assisting the media team in their budgeting and bidding strategies, and should be working across earned and owned media to ensure that data is used to fulfill the classic mission of ‘right message, right place, right time’. Then last but not least is what is in fact the most common role for the analyst – performance reporting. This is where many analysts functions begin and end, but as should be clear from this diagram, the performance that this analysts is able to convey (and there is an art and skill to this conveyance) will be built on the effort executed across the continuum. In other words, if your analytics program is not putting explicit effort into the design and execution of data collection, does not have a specialist in scientific method working on your testing, does not have some level of predictive power, is not somehow applying predictions to optimization of efficiency and effectiveness, and is not thinking strategically about what the data says, you can report performance all you want, but you’re not organized to use data to improve that performance in any way.